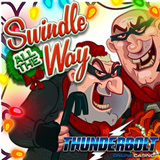 Christmas arrives early in South Africa next week when Thunderbolt Casino unwraps a special Christmas present from Realtime Gaming: the new Swindle All the Way Christmas slot game! South Africa’s favorite online casino will be offering generous introductory bonuses that include free spins on the new game when the new game launches on November 22nd. Swindle All the Way is a funny new Christmas slot where a band of bungling burglars sets its sites on Christmas presents under the tree. In the bonus game (triggered by three or more scatters) you can win instant prizes (up to 60 free spins with up to 33X prize multipliers) by finding the robbers before they make off with the Christmas loot. You'll be able to play the new Christmas slot in big-screen format in the download and instant play casino for desktop and laptop computers. There's also a small screen version for smartphones and tablet screens in the mobile casino. South Africa’s Thunderbolt Casino offers hundreds of real money online slots and table games from RTG, all played in Rands. The new Swindle All the Way joins Christmas classics like Naughty or Nice, which features the two sexiest elves the North Pole has ever seen, and the Santa vs Rudolph trilogy: Santa Strikes Back, Rudolph’s Revenge and Return of the Rudolph, the final instalment in the saga. Return of the Rudolph is a 50-payline game with an expanding Wild that triples payouts. It gives you a choice of bonus games when you hit three or more scatters. Redeemable once per week November 22 – December 22, 2017. All players that take advantage of these introductory deposit bonuses can, within 7 days, claim an additional free bonus of 50 free spins (coupon code: SALVAGEGIFTS). Play-through on free bonuses is 60X. VIP players can get an extra 100 free spins (coupon code: RETRIEVEGIFTS) with 40X play-through.